Luke Fay is the managing director of Treework Environmental Practice. He has been involved in arboriculture since 1995. As a senior arboricultural consultant he provides high quality advice to key Treework clients. His managerial role involves working closely with all members of the team. ‘The talent and knowledge in this team is both exciting and humbling and I am proud to be part of this company at a time when we are growing in both our size and providing excellent quality services’. Luke is involved in undertaking and managing surveys of large tree populations including development site surveys BS5837:2012, veteran tree surveys and tree risk surveys. He has developed the MyTrees databases and GIS for surveying and management within all of these spheres. 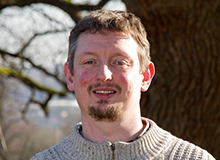 He has attended a range of courses targeted towards tree assessment and provides training in surveying for tree risk management and veteran tree surveying and management. The role he provides as the director is to lead growth and maintain high quality of service in an innovative environment.